Water, Soil And Radiation: Why Fukushima Will Take Decades To Clean Up : The Two-Way Five years after meltdowns at the Fukushima Dai-ichi nuclear power plant in Japan, progress has been made, but there's still plenty to do. The land around the plant was also contaminated by the accident. Azby Brown is with the nonprofit organization Safecast, which independently monitors radiation levels in Fukushima prefecture. He says readings by Safecast and the government show that radiation levels in the region around the plant have fallen by roughly half. "There's no question that the radiation levels have decreased compared to 2011," he says. Some of that drop is due to the natural radioactive decay, but there has also been a huge cleanup effort. 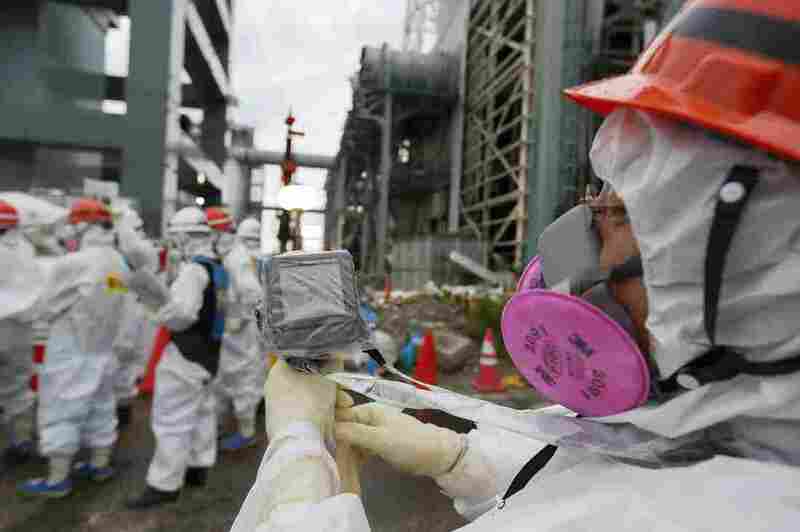 Workers across Fukushima have been scraping up contaminated topsoil and storing it in bags. And that's created its own problem, Brown says. "There are now about 9 million bags of decontamination waste from all over the prefecture that are being consolidated into these vast fields with these pyramids of radioactive waste," he says. Just like with the water, regulators aren't quite sure what to do with all that soil. Japan doesn't have a centralized radioactive waste dump to take it to. In the longer term, the biggest issue will be what to do with the highly radioactive cores of the reactors themselves, each filled with melted uranium fuel. After the Chernobyl nuclear accident in Ukraine, Soviet officials opted to pour concrete over the melted reactor core. 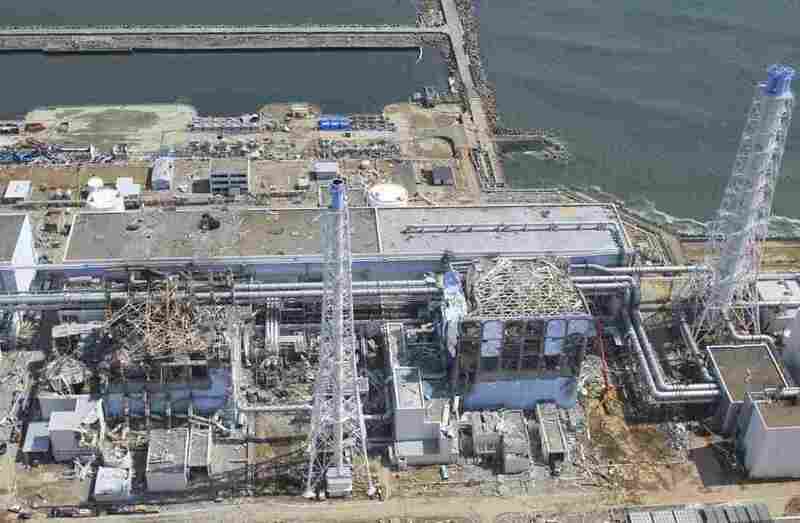 But Tepco's chief nuclear officer, Takafumi Anegawa, says Fukushima's fuel has got to be removed because the plant's presence on the coast poses a threat to the environment. "This condition cannot continue for many years," he says. 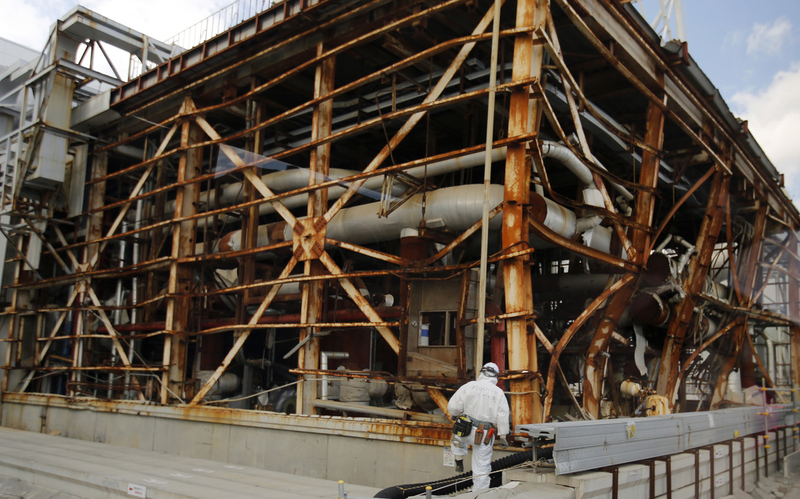 Tepco doesn't really have any firm ideas about how to get the melted fuel out. "So far, there's no specific clear solution," Anegawa says. In fact, the company hasn't even been able to look inside to see what needs to be done. Anegawa says the radiation is so intense that it's fried the circuits of several robots sent in to investigate. Dale Klein, the safety consultant, thinks that eventually robots will be used to cut up the molten cores of the reactors and seal them inside concrete containers. But he says it's not going to happen overnight. "This will be a several-decades process of cleanup," he says. In other words, the Fukushima accident will be with the people of Japan for generations to come.